The units can be booked as an entire property, and interconnect through the private courtyard area. Accommodation at Code Time Lodge B&B features 2 self-contained units each with their own private outdoor areas. Okarito is a small seaside village situated just a 25-minute drive from Franz Josef Glacier. The area is a nature lovers haven. There is a sun terrace at the property where you can relax. The accommodation is fitted with a seating area. Some units include a dining area and/or patio. There is also a kitchenette, fitted with a microwave. A toaster and fridge are also provided, as well as a kettle. Every unit is equipped with a private bathroom with free toiletries. Bed linen is available. 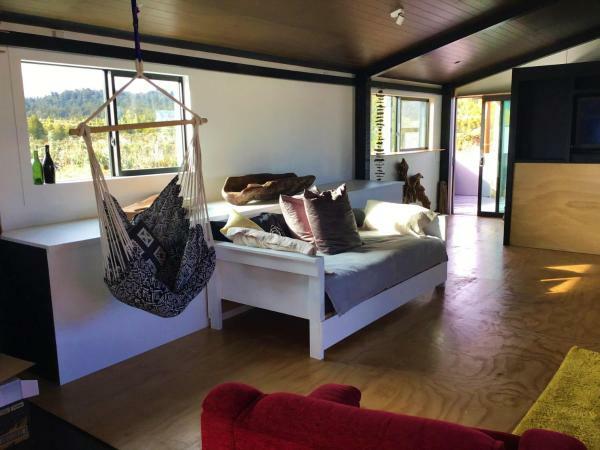 There are no shops or restaurants in Okarito, however guests are welcome to use the property facilities including a BBQ and bring their own food and beverages. Tarifa por noche desde tan solo €89.